is a young Armenian duduk master who has won numerous awards for his talent. He lives in Charentsavan, Armenia. Considered a musical prodigy, he initially began his studies at the age of six, with the shvi (an Armenian wind instrument) with mentor Krikor Khachtryan. He graduated from the Komitas State Conservatory (Yerevan, Armenia) where he studied with renowned duduk master Gevorg Dabaghyan. Despite his relatively young age (he was born in 1994), Arsen Petrosyan is a seasoned professional who has toured the United States, Russia, Canada, India, Germany, Spain (Canary Islands), France, Republic of Georgia as well. although in his country of origin. He is currently a soloist in the Armenian Traditional Music Ensemble (Yerevan) as well as in his recently created group “Arsen Petrosyan Trio”. Arsen Petrosyan goes beyond the cleavages of traditional (Armenian) music. It transports the public to countries beyond Armenia the world is his village. His various collaborations testify to this. Concerts de musique sacrée, Orgue, Duduk, et Danse (France, Juin/Juillet 2016). Concert avec l’Orchestre Philharmonique d’Arménie (Avril 2016). Enregistrement avec le groupe de rock ” Felix Crool ” (Russie, Décembre 2015). Concert avec Ali Ghamsari-Tar, Omar Bashir-Oud, Pei Bird-Vocal, Ilya Magnes-Flute (Rose Festival Géorgie, Juillet 2015). Arsen Petrosyan is a specialist (duduk), many times rewarded for his talent, He accompanied Nikko Grégoire. Arrangements at the organ, most made by Nikko Gregory, music led to meditation, to meditation. The two artists were long applauded and their pleasure of playing together was visible. Together, they plan to multiply such concerts in Europe and the USA. I had the chance to listen to Arsen Petrosyan’s music and fell in love with each note. It was so heavenly. I heard such beautiful chords and so peaceful sounds. The music of the Duduk is becoming popular around the world. I’m really happy that Arsen introduced me to this universe. I will now research the genre in depth. If you had to listen to relaxing music, this is the artist you need. JASON BRYE WEEKLY.COM United States, July 2017. Petrosyan, barely twenty years old, explores the music of Armenia, finds some in archives and accompanies with harp, acoustic guitar and soft percussion. He lets the world love the true purity and melancholy of this music. It is a real and dynamic performance that spreads in and around Armenia. The international sensation of sacred music that Arsen Petrosyan and his duduk contributed to the songs “The Silent Night” and “O Come O Comes Emmanuel”, and give a new and authentic texture to these familiar songs. The duduk is an ancient instrument that is often referred to as “the shepherd flute”, when combined with Abigail’s celestial songs, it produces a fascinating sound. CC.CALLEDTOBE.ORG, United States, December 21, 2016. 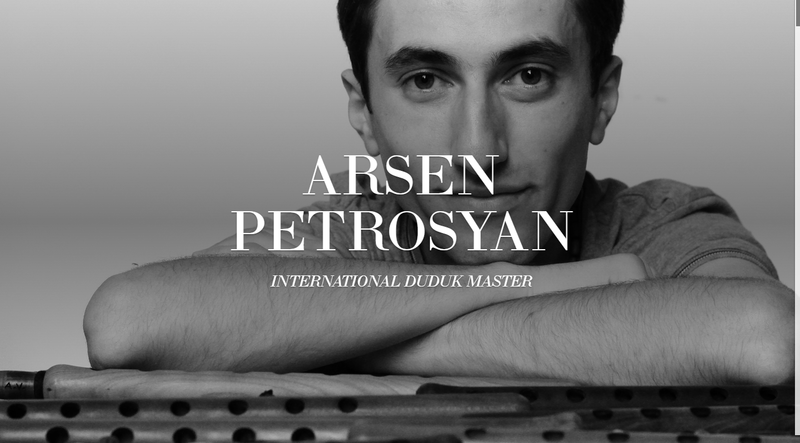 The sensation of international sacred music, Arsen Petrosyan, shows why he is considered the heir to the Armenian throne of the Duduk. Often referred to as “the shepherds flute”, the combination of touching sounds the Arsen duduk and Abigail’s heavenly voice seems to carry the listener back to Bethlehem time. Arsen and Abigail’s approach in “Where Comes O Comes Emanuel” and “The Silent Night” is simply astounding. One can easily understand why Peter Gabriel and Sting have incorporated this ancient and charming instrument into their music. WWW.TOPCATHOLICSONGS.COM, USA, December 21, 2016. The Duduk has a great history. He accompanies every moment of life of the Armenians, sad or happy. The Duduk is not only related to tears, to sadness: it is much more, light, love and life … ARMEN PRESS, November 12, 2016. Florian Moskopf’s notes mingled with those of Arsen Petrosyan’s Duduk. A real symbiosis has been created between the organ, the duduk and the choreography created by Hanane Mesbahi. Proof of their bewitchment, the spectators observed a silence of several seconds before applauding the artists. EST REPUBLICAIN, France, July 2016. The album “Charentsavan” is a nice introduction to the national instrument of Armenia that is the Duduk. Much of the album can be described as refined and formal in tone, though there are some flights. “Hazar Ernek” has the atmosphere of a belly dance; “Javakki Shoror” casts villagers’ impressions in the form of a call-and-response interaction with other instruments – though manual percussion has similarities to Southeast Indian techniques. Petrosyan is obviously a talented musician, the appreciation of the nine songs is a matter of individual taste. I would recommend visiting a site like SoundCloud to listen to what strikes your curiosity the most. CENTERVIEWSBLOGSPOT.AM, USA, May 27, 2016. Arsen Pétrosyan has subtitled his first album “Music for Armenian duduk” an instrument that is a sort of pre-Western clarinet to the weeping sound made famous by Mel Gibson’s film “The Passion of Christ”. Here Petrosyan delivers a rich array of sounds that take you to unsuspected places and times. Her veiled vibrato joins a harp on the celestial “Tapna Kervan”, in a dreamy “Hairenik” while the percussions add the mystery of the Middle East to “Hazar Ernek.” George W. Harris, JAZZ WEEKLY, United States, May 5, 2016. A young musician, Arsen Petrosyan continues the legacy of Jivan Gasparyan. His first solo album includes a popular and secular material, as well as newer, beautifully rendered. Evoking the “sound of a rocky landscape” on the border of Asia and Europe. SHEPERD EXPRESS, United States, March 1, 2016. Petrosyan’s album is relentlessly intense, played with minor touches, typical with very sparse percussions, accompanied by drone drones. The originality of the instrumental mixes with ancient themes, many of them saved from dusty archives where the music had been hidden under the Soviet occupation … For this album, the press compares Petrosyan to the 20th century virtuoso most in sight (for the duduk), Jivan Gasparyan. Delerue, NEW YORK DAILY, USA, February 6, 2016. The Petrosyan Roadmap for the History of Armenian Music leads the listener on a sound and useful journey. WORLDMUSICWIRE, 21 January 2016.The album “Charentsavan” represents pieces inspired by Armenian villages and regions that are now outside the Armenian Republic. Many of these songs had taken dust in the former Soviet archives about to become lost and neglected. Arsen Petrosyan revived them. The album is in line with those of Jivan Gasparyan taken over by Brian Eno in 1989. DEEP ROOTS United States, January 20, 2016. During his career he has participated in various competitions and is a first class winner of the “Renaissance” International Music Competition. He also participated in the TV show “New Selection for Duduk” on Shant TV and was among the ten finalists. Arsen has visited and performed worldwide in Russia, Georgia, USA, Canada, India, Germany, Spain and some other countries. His mentor Gevorg Dabaghyan characterizes the Arsen sound game as “sensitive, agile and noble”.